In this magisterial work, leading cultural critic Mary Eberstadt delivers a powerful new theory about the decline of religion in the Western world. 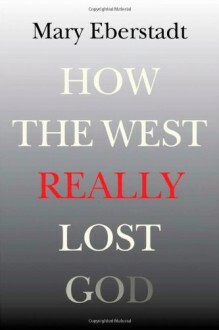 The conventional wisdom is that the West first experienced religious decline, followed by the decline of the family. Eberstadt turns this standard account on its head. Marshalling an impressive array of research, from fascinating historical data on family decline in pre-Revolutionary France to contemporary popular culture both in the United States and Europe, Eberstadt shows that the reverse has also been true: the undermining of the family has further undermined Christianity itself. Drawing on sociology, history, demography, theology, literature, and many other sources, Eberstadt shows that family decline and religious decline have gone hand in hand in the Western world in a way that has not been understood before—that they are, as she puts it in a striking new image summarizing the book’s thesis, “the double helix of society, each dependent on the strength of the other for successful reproduction.” In sobering final chapters, Eberstadt then lays out the enormous ramifications of the mutual demise of family and faith in the West. While it is fashionable in some circles to applaud the decline both of religion and the nuclear family, there are, as Eberstadt reveals, enormous social, economic, civic, and other costs attendant on both declines. Her conclusion considers this tantalizing question: whether the economic and demographic crisis now roiling Europe and spreading to America will have the inadvertent result of reviving the family as the most viable alternative to the failed welfare state—fallout that could also lay the groundwork for a religious revival as well. How the West Really Lost God is both a startlingly original account of how secularization happens and a sweeping brief about why everyone should care. A book written for agnostics as well as believers, atheists as well as “none of the above,” it will permanently change the way every reader understands the two institutions that have hitherto undergirded Western civilization as we know it—family and faith—and the real nature of the relationship between those two pillars of history.